NOTES: Injected kit with metal and cloth parts. 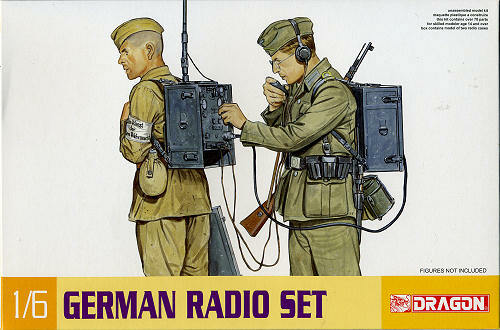 This particular radio set is the Tornister-Funkgerät Torn.Fu.d2. It is a portable VHF radio set operating in the frequency range of 33.8 to 38 MHz. Power output was approximately 1 watt providing a telephonic communication range in A3 mode of approximately 3 km and 10km in A1 mode (telegraph or continuous wave code). The unit required two 90 volt batteries and weighed approximately 17 Kg. I know that isn't much of a history, but I had to dig all that from about a dozen different web sites as it seems there isn't any single one that provides much more. I do know that the unit was in use from the beginning of the war. Dragon seems to have been doing well with these 1/6 scale kits. They are, of course, accessories for their action figures and this one fits right in with that area. The detailing on the set is superb with all the handles, knobs and other bit clearly detailed. The latches work and there are covers for the set. 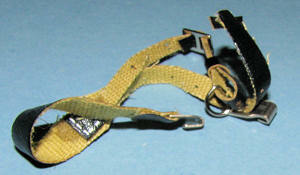 Straps are included already assembled and ready to click into place. There are sections of cord for the headset and microphone and a larger piece of tubing for the power connections. A long antenna is also included. This may be VHF, but it is the low end of the VHF frequency spectrum so needs a longish 1/4 wave antenna. 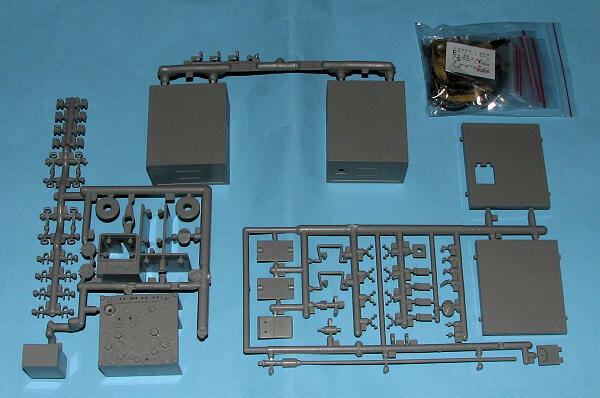 The kit isn't exactly a snap together as there are over 70 parts included with the set. Instructions are well done and show the set pretty well built with part information shown leading to its location on the built set. There is a full decal sheet for all the various dials and ID tags. That little set of bags shown in the overall view includes the straps, tubing, wires and decals. There are also a few metal parts, mostly strap loops and small plugs for the microphone and headset. The instructions would have you paint this unit field grey. Though photos on the internet can play tricks with colors, this shade is not a very dark color, but something lighter than Dark Gull Grey. Now I realize that things like this are not everyone's cup of tea. But it is unusual in that this is the first time I can ever recall anyone kitting a radio set. Those who are not into the figures, can do this one on its own as it will make for a most interesting conversation piece as well as something quite different for the display shelf. Many internet sites. Wikipedia was useless on this one. Apparently WWP does a book on things like this if you are interested. Thanks to www.dragonmodelsusa.com for the preview kit. Get yours at your favorite shop or on-line store.